These paleo coconut macaroons are a delicious and yet healthy treat. The outside is crispy and full of toasted coconut flavor while the inside is chewy and soft. And unlike most coconut macaroons, these cookies are not cloyingly sweet. Sweetened with just a touch of maple syrup, these macaroons are a delicious dessert you can truly enjoy. 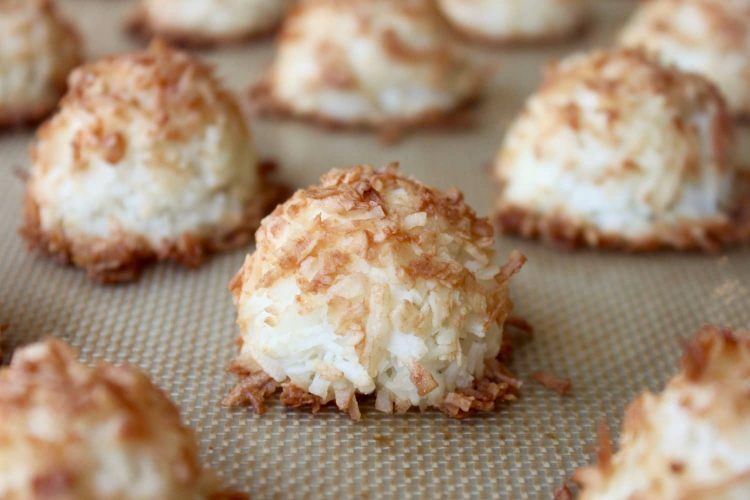 These healthy coconut macaroons are easy and quick to make. And they only contain three ingredients! 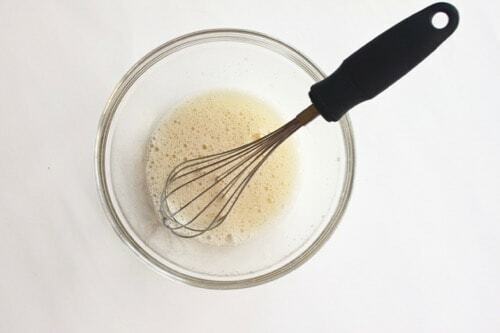 Simple whisk together the egg whites and maple syrup before stirring in the unsweetened flaked coconut. 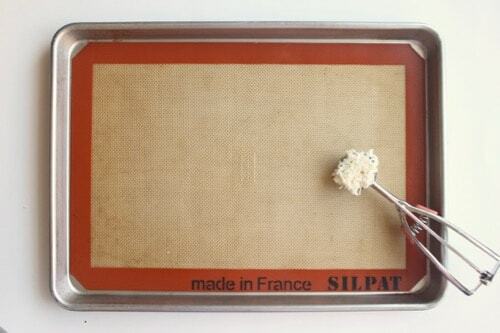 To ensure the macaroons are uniform in size, use a cookie dough scoop to transfer 1.5 tablespoon scoops of the macaroon mixture to a silicone or parchment paper lined baking sheet. If you don’t have a cookie scoop, it is a tool that I would highly recommend. It really speeds up the process of creating uniform cookies, mini-muffins and even meatballs… without a mess! In less than 30 minutes, you can have toasty and delicious coconut macaroons that are low in added sugar. Crispy and full of toasted coconut flavor, these paleo coconut macaroons are a delicious dessert that are not cloyingly sweet. 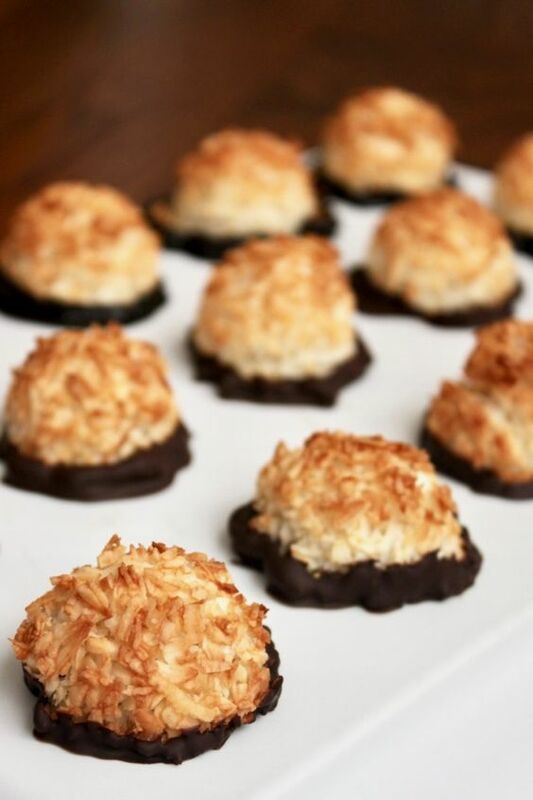 These coconut macaroons are also delicious if dipped in a little melted dark chocolate! Simply melt your favorite chocolate in the microwave (using this quick and easy chocolate tempering technique) and dip the bottom of the macaroons. Let the chocolate dipped coconut macaroons dry on parchment paper or wax paper until chocolate is set. How can I store them for a long cross country drive to be delivered as a gift? Hi Vivian – this is a good question. The macaroons are robust enough that they don’t require special packaging other than an air tight container to maintain freshness. If you would like to ensure they are not jostled around too much, you could always place them in decorative muffin papers similar to the smaller papers found in a box of chocolates. Happy Holidays! I love coconut macaroons! These look yummy. I love that it’s only 3 ingredients too. Great recipe! I hope you love them Catherine! I love that these aren’t overloaded with sugar. Sounds like the perfect amount of sweetness and a fantastic dessert! Thanks Laura! The coconut-y flavor definitely comes through in these cookies! These are by far my favorite cookies to have. Look delicious. Can’t wait to try your recipe. Mine too Mirlene, I love the toasty coconut flavor! I hope you enjoy them! I love macaroons. They are so easy to make and delicious. What a lovely recipe! Thanks ChihYu, I hope you enjoy them!!! Love how easy these are, perfect to make with kids! They look so tasty! Thank you Hope, they are really easy to make with kids… I hope your family loves them! Wow, amazing how little sweetener, and I love that chocolate dipped version (not surprisingly!) Pinning to make! So simple and SO good! Love the step-by-step pictures, thank you! Macaroons are so easy and delicious, and these look amazing! I need to try out your version. Such a super easy recipe and so pretty! My girls will enjoy making these! I made these and when I pulled them out some of the egg white and maple mixture had leaked out of the bottom of the macaroons and formed a sticky puddle underneath them. The ones with the biggest puddles didn’t hold together very well at all. What can I do to stop that from happening? Janet – I am sorry to hear your macaroons are forming a puddle. This is a problem I have never experienced. Two thoughts: 1. What size are the macaroons? I use a heaping tablespoon scoop when forming mine. If the macaroons are much larger, the egg white and maple syrup mixture may have a time to settle before cooking through. 2. How small are the pieces of shredded coconut you are using? I use a finely shredded coconut, which ensures the egg white mixture has a lot of surface area to cover, which should prevent puddling and improve overall macaroon integrity. Is it possibly to sub the maple syrup for honey? 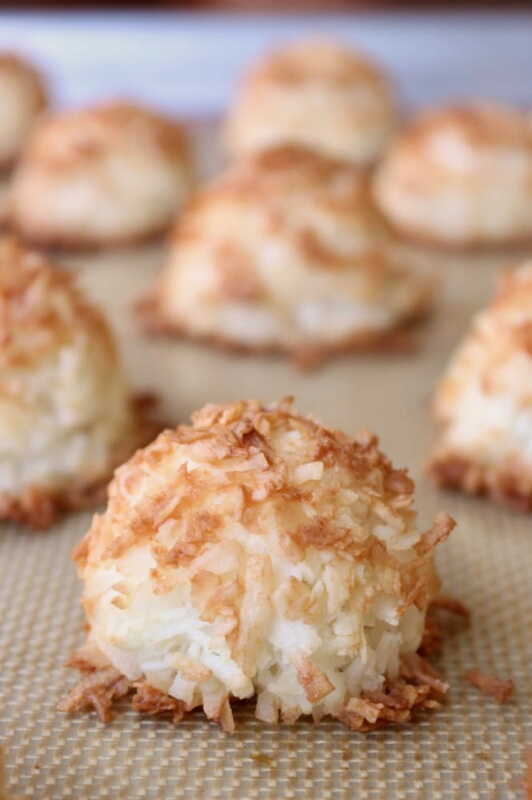 Yes, honey can be substituted for maple syrup when making these coconut macaroons. I hope you enjoy them! These look so easy to make! I love recipes that have a few ingredients, especially when they are made with coconut. 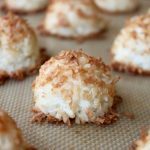 Hi Anne – these coconut macaroons are definitely easy to make and FULL of crispy, crunchy, coconut-y flavor! I hope you enjoy them! 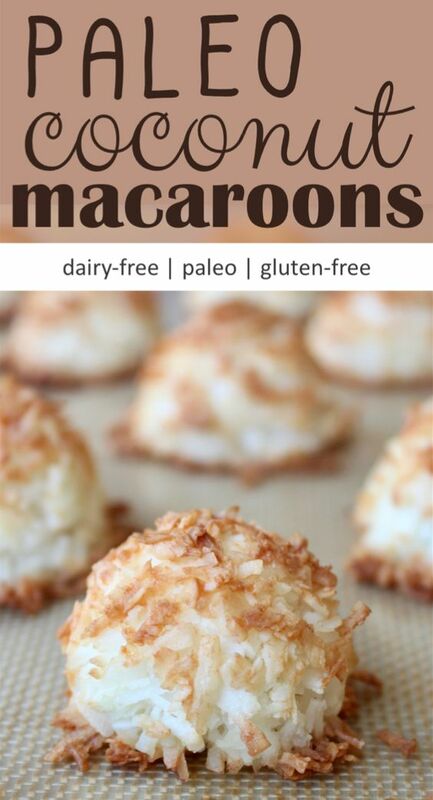 Coconut macaroons are so yummy, although I am partial to anything with coconut! 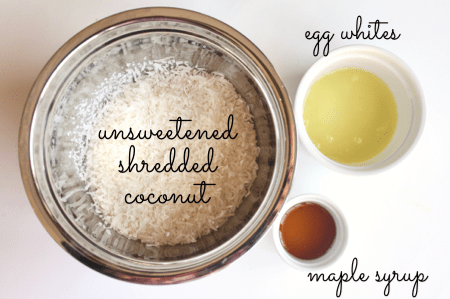 I have a big of coconut flakes sitting in my pantry now, I think I’ll have to make these this week!! These look just delicious and I’m definitely all about dipping my macaroons in chocolate! Not only do I love the flavor, but I like the texture it adds to the bottoms as well! Yummy! All my life coconut macaroons meant spring to me… Fascinated by the thought of maple flavor in them! Different and delicious! Hi Anne – Me too! Coconut Macaroons = Spring. There is so little maple syrup in these macaroons that you can’t really taste the maple flavor. I find that it simply rounds out and enhances the coconut flavor. Enjoy! I’ve never tried this kind of macaroon before. Just the little pastel French ones that taste like hollow sugar. THESE look way better. My husband loves coconut so I bet he would devour these! Thanks Jordan! 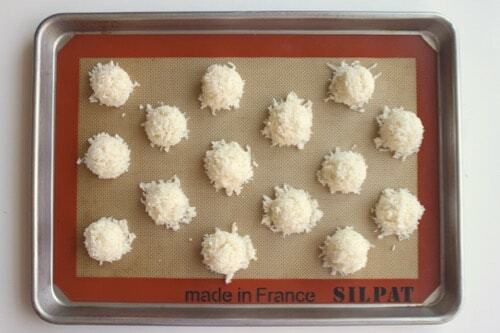 These coconut macaroons are so different from the French ones made with almond flour (which my oldest son adores!). I love that these coconut macaroons are crunchy, filling and just slightly sweet. I hope you and your family enjoy them! I’m a total coconut feen. Especially when it’s dipped in chocolate! The only problem that I have with some coconut desserts is that I feel that they are over sweetened, so I’m thing this recipe is exactly to my tastes. I can’t wait to try these. I prefer slightly sweet treats and love the flavor of coconut and chocolate together. What a great idea. Thanks for sharing this recipe! Thanks Michelle! I couldn’t agree more that chocolate and coconut are a wonderful combination. I hope you enjoy these macaroons!!! Thanks Veena! I sure hope you enjoy the macaroons! Thanks Molly! We have quite a few chocolate fans in our house, so we always dip at least half of these macaroons in dark chocolate! These macaroons look so cute ! I’m totally going to make them ! Thanks ChihYu – I hope you enjoy them! What a great simple gluten free dessert! I think I’ll make these for Easter! Thanks Cathy! 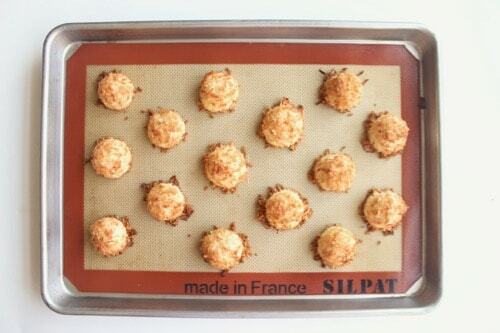 These macaroons are definitely simple & delicious. I hope you enjoy them!!! I love the maple syrup in here!! These look perfect and I love how you’ve made them healthier!! Thank you Christina! The toasty flavor of the coconut really comes out when it isn’t hidden by all that sugar. These look so simple but so tasty! Love macaroons, especially when they’re dipped in chocolate! That is as simple as it gets! I have to bring a dessert next week for Easter and I think these will be perfect! Thanks Renee – They are super simple and quick to make! I love a good dessert that can be made in less than 30 minutes. Oh I am ALL over the chocolate dipped ones!! Macaroons are the best…so easy and such simple ingredients! Oh yes, the chocolate dipped ones are my favorite too! I even dipped some in paleo-friendly melted chocolate (3T cocoa powder, 2T coconut oil, 1t maple syrup) and they were delicious! Now these are macaroons I will actually eat. I so appreciate them being not too sweet! Thanks Yang! These macaroons were inspired by overly-sweet coconut macaroons that we ate last spring. Too sweet, but the coconut was delicious. Oh, how yummy are these?! And that chocolate bottom…drool. Thanks Linda! We love dark chocolate too – I have been encouraged by my boys to add a little chocolate drizzle topping to the next batch! So easy to make! Thank you for the step-by-step images! Thanks Joni! I am so glad you found the pictures helpful! I just think toasted coconut things are the prettiest. These look beautiful!